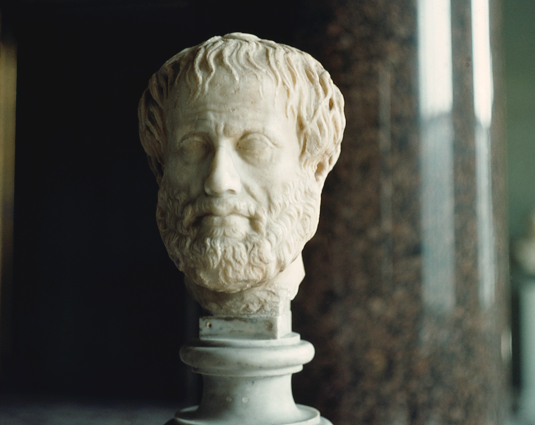 Aristotle’s Metaphysics is a seminal text in both the Western and the Arabic tradition. At LMU‘s Center for Advanced Studies, work is underway on a new edition which, for the first time, takes its reception in the Arab world into account. The material was there, but no one had explored its philosophical riches until Oliver Primavesi and Marwan Rashed decided to tackle the task. Primavesi is Professor of Classical Greek at LMU, Rashed is a specialist in Greek and Arabic philosophy at the Sorbonne in Paris, and together they are embarking on a new edition of “one of the foundational texts of Western – and Arabic – civilization”, as Primavesi says, Aristotle’s Metaphysics. It was written in the 4th century BCE, but the text has yet to be securely established. Since it was set down nearly 2500 years ago the work has been enormously influential. But the history of its textual transmission is complex and often confusing. In assembling their edition, Primavesi and Rashed will, for the first time, take Arabic reactions to the Metaphysics in the Middle Ages into account. Although Western philosophers have known of their existence, these sources have never been consulted by previous editors of the Greek text. Primavesi and Rashed wish to bring this neglected treasure to light. This is one reason why the new version of the Metaphysics will provide “an entirely new textual basis for the work,” says Primavesi, and this will alter the terms in which it is discussed.” To achieve this ambitious goal, the editors can depend on their philological skills. But they will also need the instincts and the nose for clues of a Sherlock Holmes. The Metaphysics has been endlessly argued over, and interpreted in a multitude of ways – as befits one of philosophy’s classical reflections on theology and ontology, which considers the origins, nature and workings of being. It is also relevant to the relationship between Aristotle and his mentor Plato. For later Western philosophers, Plato is the mathematician and theoretician of ideal forms, while Aristotle is viewed primarily as the naturalist and materialist. But according to Primavesi and Rashed, this dichotomy rests on shaky foundations. Unfortunately, every discussion of the Metaphysics labors under a serious handicap. No near-contemporary source of the text survives. It is not even clear whether all 14 “books” that make up the whole really belong together. The books once existed as independent manuscripts within the confines of Aristotle’s School, the peripatos. They were first published together in the 1st century BCE, and the earliest surviving commentary on the Metaphysics, which includes a few authentic Aristotelian quotations, was written in around 200 CE. At present, 53 Greek manuscripts that contain texts or fragments of the books of the Metaphysics are known. The oldest of these go back to the 9th century CE and all originated in Constantinople. All current editions of the work are based on two ‘hypo-archetypes’, referred to as α and β. These are in fact partial reconstructions of lost manuscripts, from which further copies are derived that together fall into families. The two most recent modern editions of the Metaphysics, published in1924 and 1957 respectively, are both based on the readings found in three manuscript sources, as Oliver Primavesi explains. “Several sources that belong to independent manuscript traditions have been ignored up to now.” And this has led to a great deal of uncertainty ­ – for instance, with regard to the relationships between the individual books of the Metaphysics, and their status and significance for the work as a whole. Ibn Rushd, known in the West as Averroës, was one of the great Aristotelians of the Middle Ages. He lived in Andalusia in the 12th century, when Southern Spain was under Islamic rule. His reception of the Greek philosopher’s work therefore belongs to the Arabic tradition. In his commentary on Aristotle, Averroës is thought to have used a translation of the Metaphysics into Arabic, which was probably made in Baghdad in the 8th century – and thus predates hypo-archetypes α und β. It is known that scholars had begun translating Greek texts into Arabic hundreds of years before the flowering of philosophy in Byzantium in the 9th century, initially in Damascus and later, from the 8th century on, in Baghdad. “The Syrian scholars form the crucial link,” Primavesi says. They were the first to translate Greek writings on the natural sciences and philosophy into Arabic. Moreover, although the original Arabic version of the Metaphysics has not survived in its entirety, Averroës quotes from it very extensively. He also cites the work of the late Hellenistic philosopher and historian Nikolaos of Damascus. In the first century BCE, during the reign of the Roman Emperor Augustus, Nikolaus wrote a commentary entitled “On the Philosophy of Aristotle”, in which he paraphrases and discusses the Metaphysics. The commentary written by Averroës was translated and published in a scholarly edition in 1950, but no systematic comparison of his quotations with the Greek hypo-archetypes has yet been undertaken. Primavesi and Rashed are intent on filling this gap. In addition to the comparative analysis of the semantic content of the surviving texts, in which individual passages are compared and their relative plausibility is assessed, the two editors will focus on stylistic issues. For Marwan Rashed is not only fluent in German and Classical Greek, he also knows Classical Arabic. Hence philologist and philosopher can base their decisions on the choice of variant readings on a uniquely broad basis. “We often discard a new hypothesis on the very next day,” says Primavesi. But in the course of their intensive discussions, the crucial questions – and more persuasive answers – come into sharper focus. Both protagonists regard this collaborative engagement with the text as an enormous advantage of working together under the aegis of the Center for Advanced Studies (CAS). The two have a year to devote entirely to the project. In one of the new Research Groups at CAS (see below), they will have the support of a number of internationally renowned scholars. Work on the new edition, to be published by Oxford University Press, is expected to take more than a decade. Their collaboration has just begun, but it has already borne fruit: In Book Z (zeta) of the Metaphysics, Aristotle investigates the concept of substance, which he defines as everything that exists in and of itself. Substance is what remains when one subtracts that which is subject to change, what persists in the face of mutability – the essential nature of things, the combination of form (eidos) and matter. Primavesi and Rashed have now discovered that, in Book Z, Aristotle also explicitly rejects Plato’s notion of form. For Plato, knowledge consists in the recognition of underlying forms as a purely abstract concept, of which the objects in the material world around us are but pale reflections. This explains why Plato regards mathematics as the epitome of philosophy. Mathematics attains to knowledge by focusing on idealized forms – without reference to their inevitably imperfect materializations in the outside world. The Arab philosopher’s book dates from the 12th century, but the archetype of the Metaphysics that he used is older than the hypo-archetypes α and β. So the version cited by Averroës may well be closer to Aristotle’s original than the texts that make up the Byzantine tradition, on which all modern editions are based. Primavesi and Rashed hope to determine, on textual and stylistic grounds, which of the two Byzantine versions is closer to the older version that Averroës had at his disposal. What unites the two Aristotle specialists Oliver Primavesi and Marwan Rashed is their intensive, mutual engagement with the Greek philosopher’s texts. Primavesi teaches at LMU, Rashed at the Sorbonne in Paris – and this level of close collaboration would be impossible on the basis of e-mails or other forms of digital communication. The opportunity to work together for a year at LMU’s Center for Advanced Studies (CAS) is therefore “a constitutive element” of their research project, says Dr. Annette Meyer, the Managing Director of the Center. This collaboration perfectly typifies the idea behind the new CAS Research Groups. The scheme is intended to enable faculty members to devote themselves full-time for a year to a collaborative project with visiting scholars, primarily from abroad. LMU researchers whose project proposals are positively assessed by external reviewers can recruit an international support group, whose members can spend a total of 24 person-months as guests at the CAS. Conferences and Workshops can be organized to supplement the projects. According to the Program Guidelines, a central goal of the scheme is enhance the international visibility and connectivity of keynote research at LMU. Each year two Research Groups may take up residence in CAS. 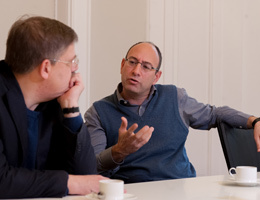 In addition to Oliver Primavesi’s “Editing Metaphysics” project, a team led by LMU biophysicist Dieter Braun is already at work on Recreating the Origin of Life. Its aim is to elucidate the prebiotic phase of chemical evolution that provided the basis for the emergence of biological evolution. The question at issue here is how the self-replicating informational biomolecules that are the basis for all life on Earth could evolve from simpler precursors. To address this problem, the CAS group, is planning a set of collaborative experiments which will be carried out in LMU’s laboratories, together with a team comprising a dozen leading experts in the field. In the academic year 2018-19, a CAS Research Group led by LMU’s Professor Donald B. Dingwell will undertake a project entitled “Magma to Tephra: Ash in the Earth System”, which is devoted to experimental volcanology. 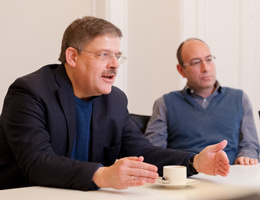 This group will be joined by a group put together by Professor Bernhard Zangl of the Geschwister-Scholl Institute for Political Science for his project “Power Shifts and Institutional change in International Institutions”.